It wasn’t long ago that we reported on a leaked invoice sheet that was believed to detail some of the specifications of the new Broadwell-E CPUs, and now a roadmap is purported to point to a Q2 2016 release for the 6, 8, and 10-core monsters, according to a leak from Chinese tech site Benchlife. While the Broadwell-E line is rumored to include as many as seven different chips, the star of the show is definitely the i7-6950X. This 10-core chip supports Hyper-Threading for a total of 20 threads, and sports 25M of total cache. The other CPUs in the lineup boast six or eight cores, all of them with Hyper-Threading, and total cache ranges from 15 to 25M. The new chips will sit in the same LGA2011-v3 socket as the now fading Haswell-E line, but may require a firmware update to function correctly. The chips will also have the same 140W TDP, so there’s no need to upgrade the PSU for increased power consumption. The new chips support DDR4 RAM of 2133 or 2400MHz, up from 1866 and 2133 under Haswell-E. 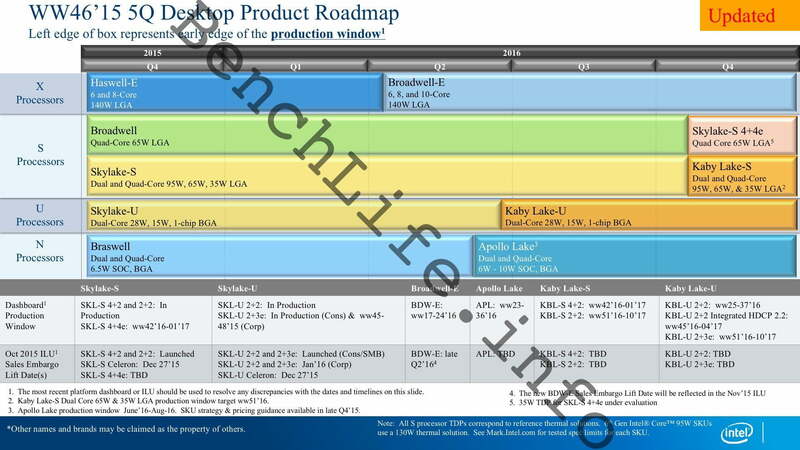 Although the Broadwell-E chips might be the most exciting leak on the Intel roadmap, it also details some other releases for 2016, including the Kaby Lake-U and Kaby Lake-S lines, which should see the inside of machines in Q3 and Q4 respectively. At the SoC level, the Apollo Lake chips are set to replace Cherry Lake in late Q2 2016, expanding the 6.5W TDP to a range of 6-10W. Users looking to put a Broadwell-E chip into their machine should brace their wallets for impact. Initial reports say the basic Broadwell-E chips will retail for around $400, with eight-core CPUs running closer to $600. In search of the ten-core 6950X? That chip will easily break a grand, especially considering the Haswell-E top chips still retail for well over $1,000. Of course, Intel has yet to confirm any info on the new Broadwell-E line, but it appears the cat is out of the bag now. With an early 2016 release, it won’t be long before Intel breaks the silence.